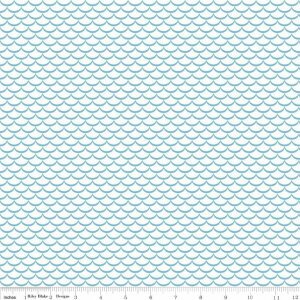 We're celebrating all things beachy with "Oceans of Fun" by Blank Quilting. 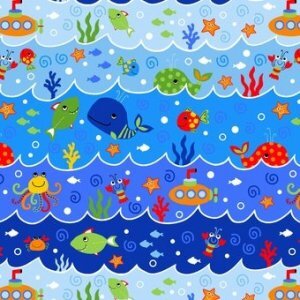 This whimsical underwater group has nine fabrics with playful fish, whales, octopus, lobsters and other sea life. Royal Blue, Light Blue, and White backgrounds allow the prints to mix and match easily. A multicolor stripe picks up bright color pop accents from the prints and makes a great border on shorts, skirts, or quilts! One of my favorite prints from this group features various characters peeking from portholes! We found "Summer Waves" from Riley Blake blends perfectly with "Oceans of Fun". 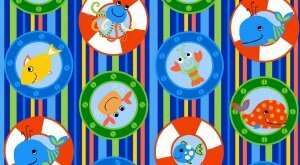 Fun beachy softie patterns from Melly & Me. 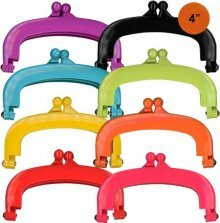 Jelly Clips - All colors have arrived! One of the hot summer trends is little purses made with bright Jelly Clip frames. We have the 4 inch frame in the colors shown to the left. The purse pattern and instructions are included with the frame. How to enter - use our "Contact Us" form and tell us why you'd like to win. One lucky winner will be selected next week. You must register for the event/ redeem the coupon by June 30th.